Travel tips, photography related stuff, recommendations, and a general chronicle of Megan and I’s adventures out and about! If you like mountains, and I mean jagged, sharp-peaked, Lord of the Rings-esque mountains, then you’re really going to love this place. The scenery is breathtaking around just about every corner, there is abundant wildlife, and it’s really a photographer’s dream. We spent about two and a half days in this rocky mountain paradise during early September, and here’s how we did it. We fly out of Austin Bergstrom International for pretty much all our excursions. As a result, direct flights are hard to come by, and our airline of choice is usually Southwest Airlines (Quiet travel snobs). So we took the cheapest flights we could book with points that would get us close, and that meant Salt Lake City. The city is about a a 4.5 hour drive from Jackson Hole, Wyoming which is just about the closest decent sized town to the park (more on Jackson later). The park itself sits just north of Jackson, so for lodging, you can definitely get away with staying in Jackson the whole time, or if you’d like to stay a little more central in the park, there are several lodging options available. Depending on your budget and how many creature comforts you like in your lodging you’ll be able to make a good decision on which location you choose, but for us we spent one night in Jackson and two nights in Colter Bay Village on the shores of Jackson Lake. While you’re here, you definitely want to spend some time walking around Jackson Square. The thing that will instantly jump out to just about anyone who’s been there are the elk antler arches on each corner of the square. These arches are massive, and they’re built entirely from the shed antlers of elk that winter in the nearby National Elk Refuge. We visited the refuge at dawn after our stay in Jackson, and while we didn’t see any elk during our visit, I’m told there are thousands of them during the winter months. Since we went in September, the elk were MIA. Oh well… there were plenty in the parks. You really can’t go wrong in Jackson, just spend some time on Yelp to find food that interests you, stock up on supplies/groceries that you’ll need when you’re in the park, and wander around the town until you decide it’s time to head to Grand Teton. Once you’re inside the park itself, just drive. As you enter the south entrance of the park, the Tetons will dominate the skyline to your left, and you’ll find yourself almost constantly peering out of your left window (just stay in your lane!). The views are amazing everywhere you look, and have your camera ready for wildlife! Elk, bison, moose, antelope and even predators can pop up just about anywhere in the park, and they can be gone in a flash, so it pays to be ready with a long lens if you’ve got it. 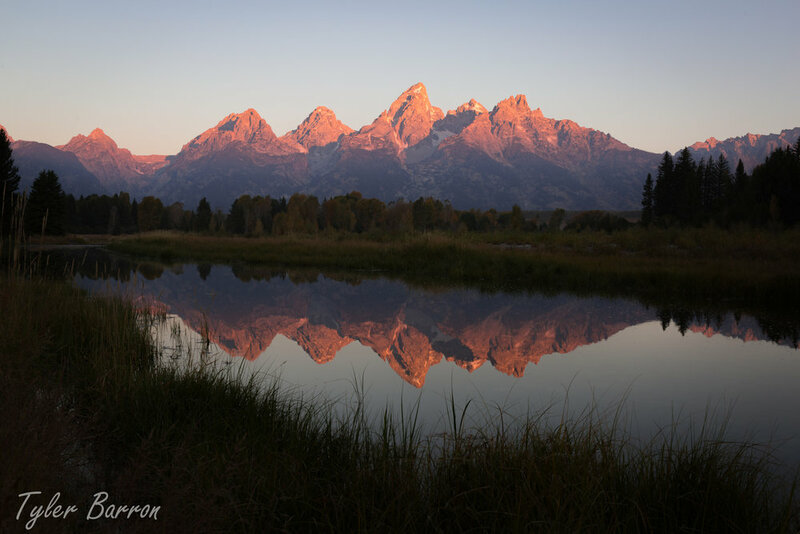 Schwabacher’s Landing - fantastic sunrise location with reflections of the Tetons in the meandering waters. Autumn color is also a definite possibility depending on the time you’re visiting. Mormon Row - a neat bit of history where you can see some very cool and rustic barns that are almost 100 years old. The Tetons behind the barns make for some fantastic and iconic photography. Just be prepared to share the area with other photographers. According to Flickr, these are the most photographed barns in the United States! Snake River Overlook - Ansel Adams was here. If you’re a photographer, you’re probably familiar with Ansel Adams, and this spot is where he took one of his most recognized photos. Definitely worth a look, though the trees have grown considerably since his time. Jenny Lake - We hiked to the far side of this lake to check out Hidden Falls and Inspiration point. It’s a fairly easy hike to there, and if you’re feeling tired once you get to the far side, you can pay a few bucks to have a boat take you back to the trailhead, or if you’re up for a full circuit, the total hike is about 5 miles. Don’t miss out on taking a small diversion to Moose Pond. As you might imagine from the name, moose like to frequent the area, and if you’re lucky (like us!) you’ll catch a moose feeding on the aquatic vegetation. Colter Bay Marina & Jackson Lake - Kayaking here was a blast! There are cabins and a small general store at Colter Bay Village, and the marina offers kayak and canoe rentals. Highly recommended as a way to get a different perspective of the mountains and cruise around one of the most beautiful lakes around. You can’t go wrong in this place. It’s unbelievably beautiful, rugged, and full of surprises at each turn!